PanARMENIAN.Net - Albert II, who reigned as the King of the Belgians before his abdication in 2013, was not allowed into the bar of an elite yacht club in the south of Italy because of his failure to comply with the dress code: the monarch showed up in shorts. The barman simply did not recognize the 84-year-old Albert II, who was accompanied by his wife, Queen Mother Paola. As a result, he had to return to his yacht and put on his pants, RIA Novosti reports citing Contact radio station. 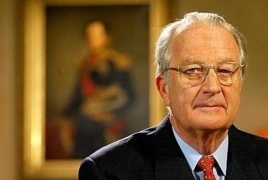 King Albert II announced that he would abdicate the throne for health reasons in 2013. He was succeeded by his son Philippe. The Royal family of the Belgium monarchy, including King Philippe, Queen Mathilde, Prince Gabriel, Prince Emmanuel, Princess Eleonore, and Princess Elizabeth, Duchess of Brabant, visited Armenia on an unofficial family vacation in August.